for over one thousand years, from the Heian era to the beginning of the Meiji era. in the Spring & Autumn. and walk for 5 minutes. the 3rd shogun of the Ashikaga shogunate. It was destroyed by fire in 1950 but was rebuilt five years later. All of the gold leaf was replaced by 1987. 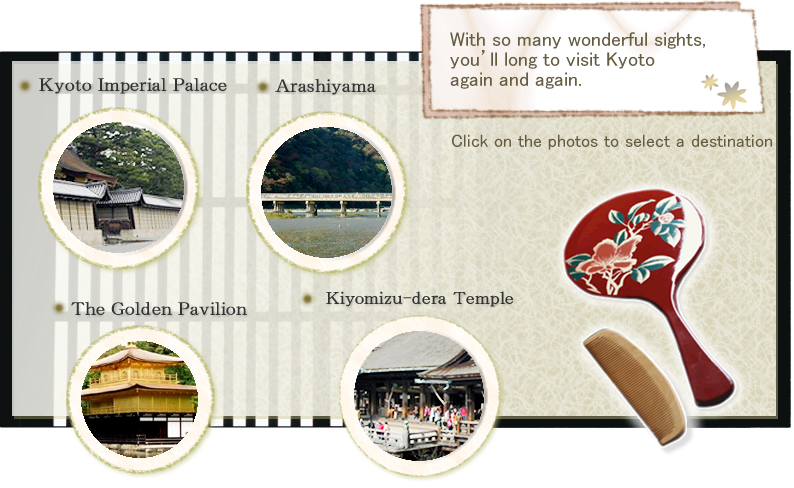 Take the number 12 city bus from Shijo-Karasuma to “Kinkakuji-mae”. It’s just by the bus stop. a spectacular view of the surrounding scenery. where you can take a drink with the long-handled dippers. and walk for 10 minutes. Arashiyama boasts many sights of its own, even for Kyoto. who enjoy the scenery of the changing seasons. The crimson leaves in Autumn are especially beautiful. Take the number 11 city bus from Shijo-Karasuma to “Arashiyama”.